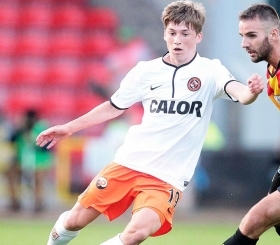 Scottish wonder-kid and now former Dundee United midfielder, Ryan Gauld has been dubbed the 'Scottish Messi' by some in Scotland and throughout the UK. Many of the top clubs around Europe had been scouting the Aberdeen-born Gauld, and on the 2nd of July 2014 it has been confirmed that Gauld had signed for Sporting Lisbon on a six-year contract with a reported whopping 60 million-euro release clause. Gauld is at his free-flowing best when playing in an attacking midfield role and can be just as comfortable and effective whether that be in the middle, on the right or on the left of a three behind the striker in a 4-2-3-1 formation which Dundee United used most prominently. His petite stature at a mere five foot six is one of his biggest attributes similar to that of Lionel Messi. This gives Gauld a low centre of gravity and an impeccably quick and efficient change of direction. The youngster, despite only being 18 years old has already amassed nearly 50 appearances at club level and has already found himself part of the Scotland Under-21 setup having made the jump from the Under-19's. Scotland manager Gordon Strachan has been one of the many coaches in the game praising Gauld and what he can bring to a team which suggests that a full international call-up despite his tender age could be on the cards. Many believe that the move to Sporting Lisbon may have been his 'big move' but I don't believe that will be the biggest move he will make in his career, as he can only improve with the Portuguese game being more suited to his game. I would not be surprised if Gauld has made another step upwards into the very top level of the European game with potential move back to the U.K. with one of the top Premier League teams.